This charming book is perfect for early readers as they learn to discover God for themselves. With beautiful colour illustrations and favourite Bible stories, it makes a special gift for any child. Ages 4-7. Meryl Doney is Director and freelance curator of Wallspace, an exhibition venue in the church of All Hallows on the Wall in the City of London. Its aim is to provide a spiritual home for the visual arts in the capital. Meryl Doney has written more than 130 books for adults and children with sales over 3 million copies, including Who Made Me? ; How the Bible came to us; All the Company of Heaven, and The Very Worried Sparrow. 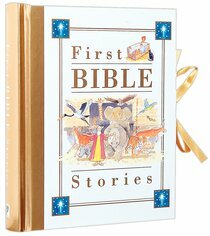 Customer Reviews For "First Bible Stories"
This was the first "Bible" for my children and has been loved to pieces, literally! The illustrations are large and captivating - a good balance between simple child-like characters (without being too comic) and  life-like backgrounds. Stories are covered over a number of pages which for my boys helped them feel like they'd had a good story session. It also means they had a number of pictures to flick through after the reading, to mull over the story for the day. I felt it dealt with the major stories well from The Creation to Pentecost but goes no further. It stays true to the bible stories without drawing conclusions for the readers. Instead it leaves parents and children to make of it what they will which I prefer. It has covered ages 3 to 6 exceptionally well but was quite passable as the introduction for the 2 year olds and possibly could have stretched to a 7 year old too. The only reason we're moving on is because it has fallen apart from use. I will miss it.